The statistics are startling. But while the number of newly diagnosed cancer cases in Canada is increasing, survival rates are also increasing. And at least one third of cancers are preventable. World Cancer Day is raising awareness about these facts, improving education and inspiring action to unite the cancer community and reduce the global cancer burden. 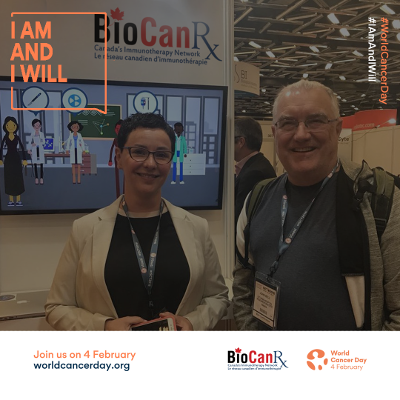 On February 4th, BioCanRx is proud to take part in this global initiative aimed at making a commitment to a world without cancer. Across the country, the BioCanRx network is accelerating to the clinic Canada’s most promising and innovative cancer immunotherapies designed to save lives and enable a better quality of life. We are finding new ways for the body’s immune system to outsmart and kill cancer. Working with our partners in industry, patient groups, not for profits and government organizations, we are translating immune-based technologies from the lab into early phase clinical trials. We’re also addressing the socio-economic considerations necessary for their adoption in the Canadian healthcare system. This year’s World Cancer Day theme is ‘I Am and I Will.’ Everyone has the power to reduce the impact of cancer – for ourselves, the people we love and for the world. Join us in committing to taking steps towards a cancer-free world. Every action counts. What will you do?